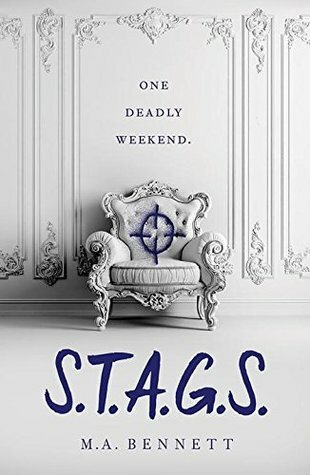 Seventeen-year-old Greer, a scholarship girl at a prestigious private school, St Aidan the Great School (known as STAGS), soon realizes that the school is full of snobs and spoilt rich brats, many of whom come from aristocratic families who have attended the institute throughout the centuries. She's immediately ignored by her classmates. All the teachers are referred to as Friars (even the female ones), but the real driving force behind the school is a group of prefects known as the Medievals, whose leader, Henry de Warlencourt, Greer finds both strangely intriguing as well as attractive. The Medievals are all good-looking, clever and everyone wants to be among their circle of friends. Greer is therefore surprised when she receives an invitation from Henry to spend a long weekend with him and his friends at his family house in the Lake District, especially when she learns that two other "outsiders" have also been invited: Shafeen and Chanel. 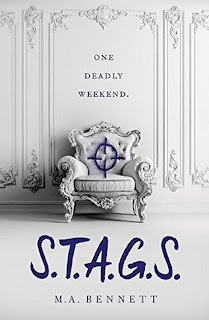 As the weekend unfolds, Greer comes to the chilling realization that she and two other "losers" were invited only because they were chosen to become prey in a mad game of manhunt. Please visit our Twitter, Facebook, and Instagram pages to see your 3 chances to win. Good luck! Labels: ARC giveaway , giveaway , M.A. Bennett , S.T.A.G.S.